Travis County Sheriff Sally Hernandez, who oversees the sheriff’s department in Austin, Texas, is putting illegal aliens above her own deputies by refusing to comply with federal law and rejecting bullet proof rifle-resistant vests her office would receive from the federal government. Texas received $23 million in federal grant money that would allow its law enforcement departments to purchase 33,000 rifle-resistant vests. More than 400 law enforcement agencies can apply for them– but in order to do so they have to comply with federal law. Each department head must sign a letter stating that its officers will cooperate with detainer requests from Immigration and Customs Enforcement (ICE). Gov. Greg Abbott added this stipulation knowing that not all of Texas sheriffs comply with ICE, including one of his Democratic challengers and sanctuary sheriff from Dallas, Lupe Valdez. UnfortunatelySheriff Sally Hernandez is no different. She maintains the same illegal sanctuary city policy as Valdez for Austin, which is why she isn’t going to sign the letter and by doing so forfeits life-saving vests for her officers. Travis County never submitted its application for $240,000 in grant money to purchase roughly 200 rifle-resistant vests last year, KXAN news reported. 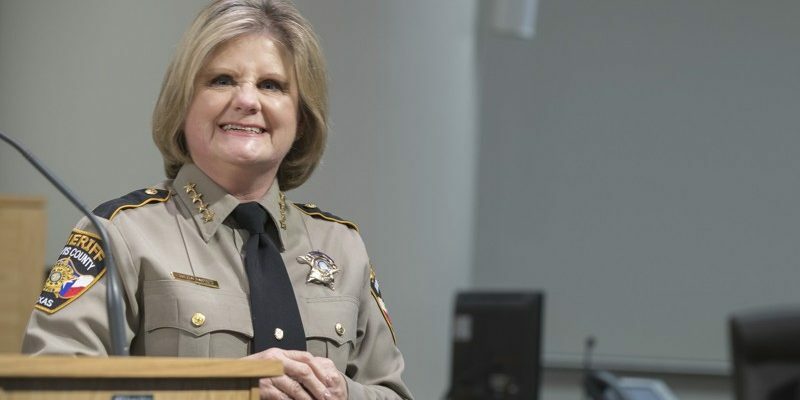 Travis County Sheriff Sally Hernandez refuses to give her deputies rifle-resistance vests funded by the state because she would have to commit to holding arrested illegal aliens for deportation. At issue is the length of time an illegal immigrant is detailed in a county jail. Once an illegal has been arrested on criminal charges, ICE submits a request to the local law enforcement department to detain them longer until ICE picks them up to process them for deportation.